Mallory Burke was initially nervous when she learned Felicia Waldock was named the Colerain girls’ soccer coach. Burke, a junior midfielder, was unsure of how a deaf coach might impact the team. Junior outside/center midfielder Sofia Wilmes had difficulty understanding Waldock and wondered how she would create a bond with the new coach. 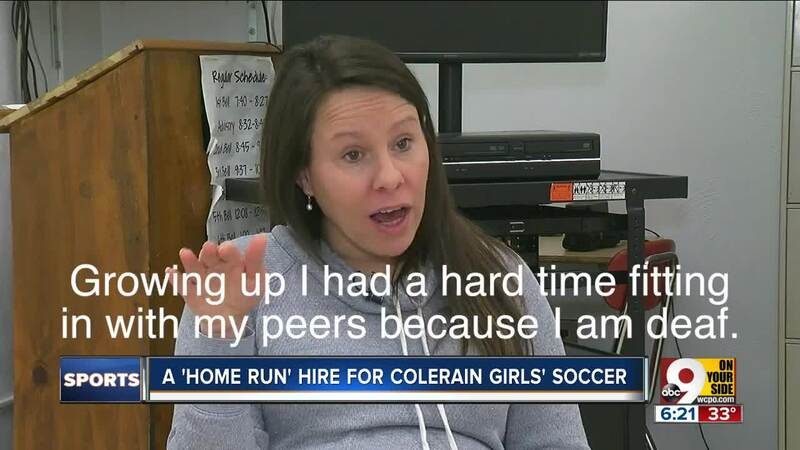 COLERAIN TOWNSHIP, Ohio — Mallory Burke was initially nervous when she learned Felicia Waldock was named the Colerain girls’ soccer coach. Burke, a junior midfielder, was unsure of how a deaf coach might impact the team. Junior outside/center midfielder Sofia Wilmes had difficulty understanding Waldock and wondered how she would create a bond with the new coach. Yet once the team gathered for a mid-December meeting prior to the Christmas break, that nervousness within the Colerain players subsided. The anticipation and energy turned up significantly. Waldock (Schroeder), an American Sign Language teacher at Colerain High School, is one of the most accomplished female soccer players from the Cincinnati area in the past 15 years. Her impact has been immediate for Colerain (6-9-2 record in 2018). Waldock, a 2005 Oak Hills graduate, played at South Carolina and at Purdue before playing professionally in Finland and Sweden. She is tied for fourth all-time with 37 goals in Oak Hills history. She is seventh in career points (85). Colerain High School is a short drive from where she lives with her family in Green Township. Soccer continues to represent so much to her life. More importantly, though, is Waldock’s charisma through athletics. She is a role model and inspiration. “I think she will do a tremendous job of breaking down the game and teaching the girls the right way to play,” said Adam Waldock, Felicia’s husband. Waldock was previously an assistant coach for the Ohio Elite Soccer Academy along with stops at the University of Cincinnati, Texas A&M International and Benton Central High School in Indiana. Waldock finished her high school career as the third all-time scoring leader and was a three-time all-Greater Miami Conference player. She also played point guard for the Oak Hills basketball team. Wyoming Athletic Director Jan Wilking coached Waldock in junior varsity and varsity basketball at Oak Hills. Wilking used hand signals to call plays to the team. Waldock’s collegiate career began at South Carolina, where she led the team in points (seven goals and two assists) as a sophomore in 2006. She was homesick and transferred to Purdue her junior year and helped lead the Boilermakers to a Big Ten Championship and a No. 4 national ranking entering the NCAA Tournament that season. She later played in Finland and Sweden and collected three gold medals for the US Women's Deaf Soccer team, twice in the Deaflympics in 2009 and 2013 and the Deaf World Cup in 2012. Felicia Waldock played professionally in Finland and Sweden after her collegiate career. Adam Waldock said Felicia’s ability to compete internationally allows her to quickly make connections with strangers of any background. Adam said it was a “no-brainer” to offer support to his wife for the coaching opportunity. Felicia is pregnant with the couple’s second child and is due in April. Ulland knew how much soccer experience Waldock had but he said it was important the new coach connect with the Colerain players on a personal level. Everywhere he turned, the green light was given. There are three ASL students within the soccer program.